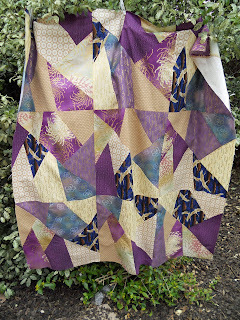 Well, this random-looking patchwork throw should have been made with Fat Quarters but the deep blue piece with the cranes, which was the piece I most wanted to use, was a bit undernourished so the other pieces had to be cut down to match. The nine pieces of equally sized fabric were stacked one on top of the other and all cut at the same time so that the square could be re-assembled in different colour combinations. The final result is a bit under the size of 9 fat quarters. I'm still trying to decide what colours to use for the borders.